In my most recent posts I showed off: 1) Sandra Bullock killing a computer virus and ordering pizza online, 2) a cartoon making fun of all academic disciplines I refer to this blog, 3) images of cute furry animals – dead and alive. I will not be able to top that. Thus I feel free to bore you readers to death again with one of my classical wall-of-text-y posts on physics, buffered by some fluffy philosophical musings. I will even do what is a no-no for a wannabe popular science blogger: Adding a mathematical equation. I am quite obsessed with trying to understand how and if the world around us makes sense to us. Are we natural Newtonians, provided with a feeling for system dynamics? Disclaimer: This posting is strictly limited to classical dynamics. Even simple classical systems can get complicated, messy, and very interesting, so we do not yet need to invoke spooky quantum effects. Physics shows on TV present simple facts as amazing stuff – and the audience is baffled. So my gut feeling is that we don’t have a very natural grasp for understanding nature. Isaac Newton has provided us with a formalism that allows for the calculating how objects move in space when forces act on them. This is calculus, a field often encountered with fear and/or fascination by non-science majors. Differential equations, such as Newton’s First Law, put into symbols concisely what we mean by feedback loops and incremental reactions and backreactions. This is powerful, elegant, allows for predictions – and makes a lot of metaphysical musings on ‘causality’ obsolete – in my humble opinion. Due to the force the marble moves, and due to the motion the force changes – since the force depends on the position of the marble. Due to the changed force the motion of the marble in the next moment changes. This might sound even poetic, but isn’t the equation version stunning? x is the position of the marble, m is the mass of the spring and k a parameter characterizing the stiffness of the spring. The distance of the marble is supposed to be a function of time, x(t). You might see that I did not include gravity here – the marble is not dangling on a spring extended in vertical direction, but the spring is moving horizontally, such as gliding on a table. The table compensates for gravity (in a sense). The second derivative of this function – the acceleration – is proportional to the function itself, at any point of time. Some great physicist, I believe it was Landau but I cannot say for sure (I would appreciate corrections), once said that you only understand a differential equation if you can describe the solution without actually solving it. An excellent description of the full solution can be found in the fabulous Physics Tutorials blog. What I mean by an intuitive understanding is this: You can describe the motion in natural language, and you can translate back and forth to the mathematical description without calculating every single step. Yet there is no shortcut for or replacement of a deep understanding of the math. But just starting from the equation and looking up or recalling the memorized standard solution for ‘homogeneous ordinary differential equations of first order’ is not what I would call intuition. Imagine the spring…. We need to start somewhere right in the middle, so let’s start with the spring stretched to the maximum extent. The marble stands still, velocity is zero. Now we release the marble. According to the equation, there is a rather large acceleration – proportional to the large stretch of the string, with opposite sign to the distance of the marble from its equilibrium position. The acceleration will give rise to an increase in velocity, actually the acceleration is the increase in velocity – it is the curvature of x(t). Since the acceleration is large, the absolute value of velocity will increase fast, and x(t) would appear strongly curved. I am drawing a little curved snippet of x(t) in red. As velocity gets larger, the distance x becomes smaller. As x becomes smaller, the acceleration becomes smaller. Since the acceleration decreases, the velocity does hardly change. If the velocity does not change, x(t) is expected to be a straight line. Thus near x=0 I expect the solution to be a straight line and draw a snippet of x(t) accordingly. When the marble has passed the zero position, x increases again, but with the opposite sign. I extend the red, nearly linear snippet. An acceleration starts to build up that corresponds to a decreasing velocity. At a certain position x the absolute value of the acceleration is the same as for the corresponding x ‘on the other side’. Thus the motion is kind of mirrored. So we need to hit a point with velocity equal zero again. The acceleration is also zero then which means the function x(t) displays an extremum (zero curvature). Starting from the extremum, x(t) is bent again back to the line x=0. Adding a curved snippet of x(t) below the t axis which looks like the mirror image of the initial snippet, just translated by a time difference. At x=0 there is no curvature at all. Now we try to connect the snippets, and I guess, the sketched curve already looks familiar. We have rediscovered the characteristic features of sine (or cosine) functions without solving the equation. The equation even gives us a first taste of an important concept in physics: Symmetry. It is symmetric with respect to time, in physics lingo. If we replace t by -t nothing happens, as there is only t squared. ‘Nothing happens’ translates to: If we have found solution x(t) (sine, cosine, combinations of them) we can replace t by -t in the solution and the result is another valid solution. 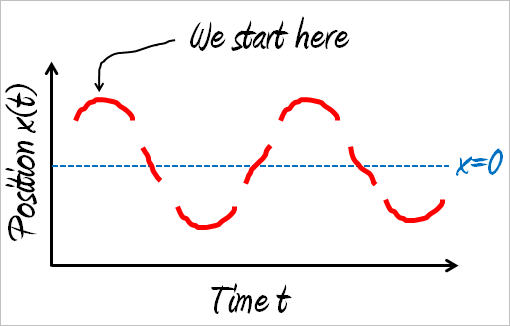 If we would add friction to it, that will change: Typical friction forces are functions of the velocity – so the first derivative of x with respect to time enters the equation and the infamous arrow of time cannot be reverted again. Now replacing t by -t would result in replacing something like exponential decay by exponential rise. Back to language and philosophy: What is ’cause’ and what is ‘effect’ here – the force exerted by the string or the motion of the marble? I feel myself confirmed by Bertrand Russell who considered many ‘classical philosophical, metaphysical questions’ just unnecessary musings that would be resolved by a more rigid analysis of language and a solid framework of logics. Since Einstein, distance is between events, not between things, and involves time as well as space. It is essentially a causal conception, and in modern physics there is no action at a distance. All this, however, is based upon empirical rather than logical grounds. Moreover the modern view cannot be stated except in terms of differential equations, and would therefore be unintelligible to the philosophers of antiquity. Practice, practice, practice. Make them a part of daily routine. At the beginning – after having recovered from initial shock of exposure – try to wrap your head around and understand the physics behind the mathematics. Do not simply follow the solutions manual. Today mathematics software allows for solving algebraic equations and differential equations easily. I have mixed feelings about this. I have always admired the analytical skills and problem solving skills of scientists from Eastern Europe who had been trained in the cold war era. They had to learn how to solve stuff with brain, pencil and paper due to the sheer lack of resources in terms of expensive computers. Thus it is remarkable (to us, today) that Newton has proved his laws in calculus geometrically. I stand in awe of geometrical proofs of stuff like that, e.g. as published in On The Shoulders of Giants. Margaret Wertheim describes in Physics on the Fringe that even Richard Feynman once struggled real hard with understanding Newton’s original proof. I would be interested in other definitions of an intuitive understanding of nature. Do you think mathematics is required, nice-to-have or has it just been picked by biased natural scientists who simply prefer to think about – for example – motion in the way I have described? Probably my deliberate choice of such a simple equation is a bit of cheating anyway: My so-called intuition fails epicly when (mechanical!) systems become more complicated and chaotic, and I cling to the remember-the-solution approach. This entry was posted in Physics, punktwissen, Science and Technology and tagged Classical Mechanics, History of Science, Intuition in Physics, Learning, Newton, Philosophy, Russell, Science by elkement. Bookmark the permalink.